Food allergies have become an important public health issue especially in industrialized countries. To prevent possible life-threatening reactions, allergic individuals have to strictly avoid the consumption of the allergenic food. Appropriate analytical methodology for detection of traces of allergens needs to be developed and implemented. Moreover, the effect of food processing on both allergenicity and detectability needs to be investigated. The unintentional possibility of cross-contamination during food production needs to be carefully monitored. This review focuses on the latest developments in food allergen analysis with special emphasis on biosensors. 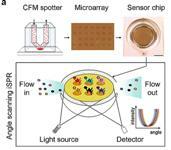 Different biosensor formats and their application to food allergen analysis are reviewed.